One factor is crucial in finding the right candidate: time! Time is money. This also applies to recruiting vacant positions. But what is hiding behind the metric time to hire? Are you aware that the success of a business can depend solely on this metric? In this article, we'll illustrate how important time to hire is for the entire organization through four examples. In addition, we'll provide you with valid arguments and figures for your next internal discussion that will make analyzing time to hire a priority. To understand all the other consequences associated with the concept of time to hire, it is important to first discuss the definition of this KPI. What exactly is the meaning behind the term "time to hire"? The term "time to hire" is not clearly defined in literature. Companies usually speak of the duration of the employment search as a key figure. However, this only describes the period between the beginning of the recruitment search and the end of the recruiting process. In reality time to hire covers a much larger period. It does not start with recruiting, but much earlier: from the day it is clear that an employee will be leaving the company until the job is filled by a new employee. Time to hire can be divided into different phases: preparation phase, personnel search phase and decision phase. Fig . : Phases of time to hire as already mentioned in the first section. It is important to be aware of the costs that arise at this time for the recruiting department or for the whole company. What costs arise with time to hire? The external budget: These costs are incurred by placing job advertisements on various job boards and are used to find and recruit candidates. 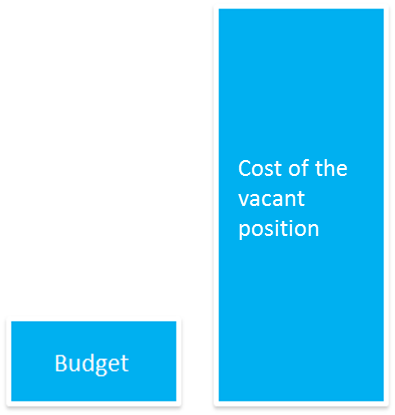 The cost of vacant positions: This includes all the costs incurred by the company as a result of an unoccupied position. This includes loss of revenue due to production restrictions or failure due to lack of customer support. These costs increase according to how crucial the position is to the function of the company. Costs of a vacancy: These include, for example, production losses due to lack of market and customer support. Costs of recruitment: These are, for example, costs for advertisements, alumni fairs, etc. Who belongs to which income group? The lower income group includes, for example, a "hairdresser". The search period of one month is a realistic value in relation to the degree of qualification and the demand on the job market. The middle income group includes, for example, young graduates. In our experience, two ads with a minimum of 30 days each have to be shown in order to reach this group. As a result, at least 2.3 months should be scheduled for the search phase alone. The upper income group is largely specialized staff with many years of experience. This group of professionals and senior professionals is considered to be particularly difficult to a recruiter as it places high demands on their job and employer and is difficult to achieve due to passive search behavior. For this reason, the search periods are much larger. 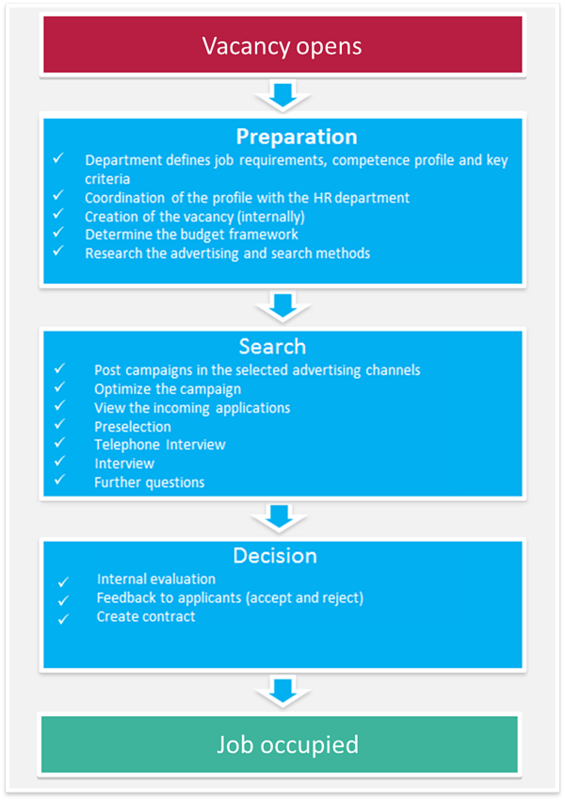 Caution should be exercised with these values: In general, it should be recognized that only the search and recruitment phase have been taken into account and not the preparation phase and the decision phase. The actual time to hire is so much longer in this case and the costs are therefore higher than the above average values. Therefore, an even longer search phase (pure advertising phase) can be expected today. A vacant position in the field of "sales" hits a company particularly hard, because this department is mainly responsible for the entire company turnover and even the loss of a single person has a strong impact on sales. If a key position is not filled here, this can mean a loss of sales of 300,000 euros per month for a company and at least 1,210,500 euros during the recruitment period! An example of this calculation: a senior sales representative in mechanical engineering. 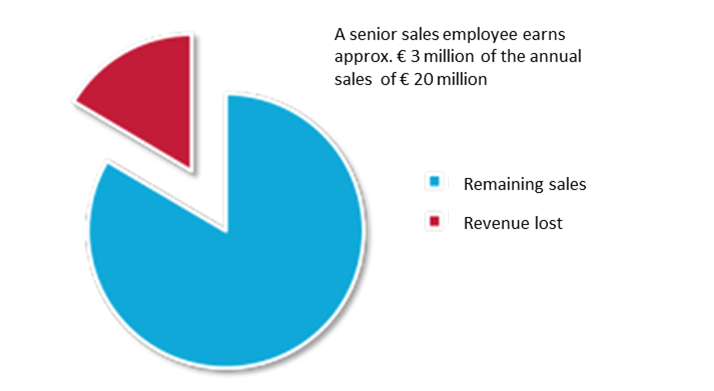 A company in the mechanical engineering sector with ten sales employees generates 20 million euros annually in sales. The sales team is divided into three senior sales people, who provide 50% of total sales, the other seven together generate the rest of the turnover. Our ratio assumed that the best senior salesperson with 4 million euros in annual sales is outstanding. 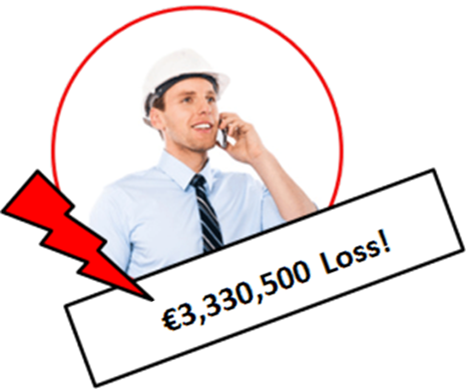 This means a monthly loss of 300,000 euros for the entire company! 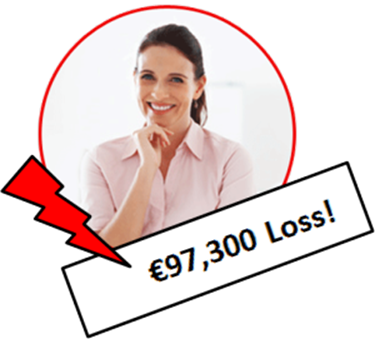 In addition, there is a gain (increase in value) of € 75,000, which is lost to the company every month. The fixed costs of the company remain unchanged (personnel salaries, room rents, depreciation, etc.). This clearly shows the extent to which a single employee in a key position can already have an impact on the company's total revenue and which cost development leads to increasing time to hire. In many companies, it is specialized positions that are the most difficult to fill. It is particularly serious for a company if the position of the production manager remains vacant for a long time. 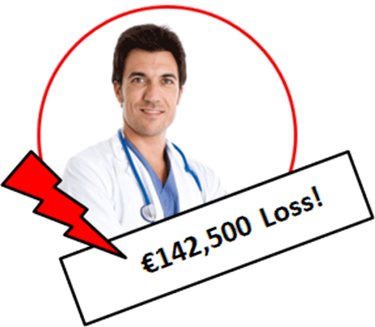 This can affect up to a loss of revenue of 830,000 euros per month! During the recruitment period these costs amount to at least 3.3 million Euros! In health care, it is the position of the specialist, a highly specialized position with certain qualifications, which is very difficult to fill and often with a long time-to-hire. In an unoccupied place can be expected here with a pure yield loss of up to 33,000 euros per month! During the recruiting period these costs are at least 142,500 Euro! Finally, let us give an example from our own experience: the vacant position of a "store manager", as an important key position in retail. 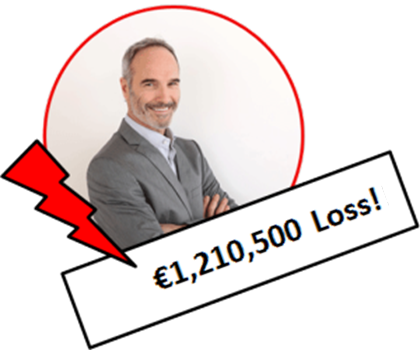 Alone the lack of a branch management can make a loss of sales of 21,700 euros per month! During the recruitment period these costs are at least 97,300 Euro! The above examples make it clear once again what impact time to hire has on a company's costs and losses. A reduction of this period is money that remains in the company and can be used for economic growth and competitiveness. Employees are the most important resource in the company and key positions that can not be filled quickly lead to serious and economically measurable losses. For small companies, an unoccupied key position over a longer period of time can even lead to financial bankruptcy if the fixed costs can no longer be met due to the decline in sales. These examples illustrate the importance of reducing the time to hire and the valuable economic contribution that the recruiting department can make to the entire organization with optimization in this area. What can be done to reduce time-to-hire? An efficient way to reduce time-to-hire is to increase the number of prospects your business has in your talent network and to build strong relationships with them. Through the targeted establishment of a candidate database, vacancies can be filled quickly and efficiently by recruiting directly from this pool of interested parties. Check out our page "The Ultimate Guide to Recruitment Analytics and KPIs" to find further resources on the topic of recruitment analytics and KPIs.